Sunny. High 66F. Winds NW at 15 to 25 mph..
Live long and prosper. Is anyone disputing the benefits of exercise and recreation, NO! As a health care provider, albeit for animals, and an active person there is little negative to be said against an active lifestyle. The issue IS and continues to be the unfair taxation of rural Tehachapi for the wants not needs of the TVRPD to the tune of $43 million with interest totaling over $86.75 million costing the majority of you thousands of dollars over 30 years. Ninety percent of this boondoggle will be spent within the city limits, according to information presented at the Golden Hills CSD special meeting on Aug. 30. Only 25 percent of the properties are in city limits leaving 75 percent of properties funding this potential money pit many of which are over 10 miles away. Rural Tehachapi, Keene, and Hart Flat unite and vote no on R. We do not have to pay and pay and pay. Can you trust the current political arena with $43 million? For those of you active on your computer, go back to the March 22, 2018 article in the Tehachapi News and take a real good look. Let us recap. Mentioned three times “The $43 million is the maximum amount we would go after. That doesn’t mean we are going to,” but they did! Besides Isom Advisors garnering thousands, the winner of $48,478 is Barker Rinker Seacat. Why has the dream of a 60,000-square-foott recreation facility at $11 million ballooned to over $26 million? Ah, the printed bond table … four series of bonds, the last of which would be funded in 2026. 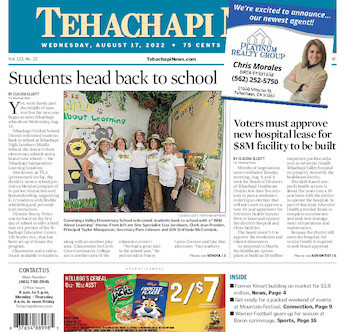 In the Tehachapi News May 23, 2018, according to Isom Advisors, a Division of URBAN Futures Inc. (that is URBAN not rural), the results of their phone survey the approval rating were 71-74 percent at the taxation rate of $12.00 per $100,000 of assessed property value. This was an acceptable amount of those 400 surveyed and would meet the required 2/3 votes to pass. The approval percentages dropped with increased taxation and did not meet the 2/3 votes. It cost $7,500 for that “phone” survey. At one of the “educational“ meetings the question was asked how could the TVRPD spend $70,000-$80,000 to place the bond on the ballot without having another survey? TVRPD’s response, “it costs $7,500 for Isom to do another survey,” a gamble with a bet of $80K. According to Veterinarian’s Money Digest, Wallethub analysts rank California at the bottom at 48th in return on investment for tax dollars. Locally, this is even more evident. Now Colorado ranks fourth; maybe the TVRPD “business” plan will work there. The business plan is flawed with unsubstantiated assumptions almost surely guaranteeing a future parcel tax in addition to the $43 million bond and increased fees to access the recreation center. Of course, if you listen to those in the local current political arena, this is all “fake news” but numbers do not lie. If that is the case then this and everyone's “informational” articles published, past, present and future cannot be believed, let alone the ever-changing TVRPD website. Tehachapi has many recreational opportunities. Benz Visco Youth Sports and Cultural Center, private fitness centers, Lehigh Mt. Bike Park, Tehachapi’s school sports, Golden Hills Nature Park and Trails and others not under the reign of TVRPD parks. Such a shame that $70,000-$80,000 of our tax money is lost on the unreasonable and unsustainable Measure R, not to mention the donated money of more than $60,000. I am sure a local contractor could build bathrooms for our existing parks with $140,000. Rural Tehachapi, enjoy our land of four seasons, take your loved ones' hand, grab the dog and enjoy a walk. It is free and healthy!! Join the ranks of common sense and vote no on Measure R!! Beverly Billingsley, DVM, is a local veterinarian, Tehachapi resident for 29 years and a grandparent.